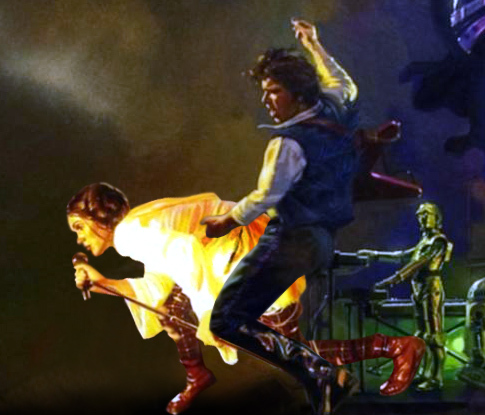 Fruitless Pursuits: Let's Speculate on Star Wars Episode VII! Let's Speculate on Star Wars Episode VII! I was convinced that Star Wars was about to go into extended hibernation but today’s surprise announcement (that Disney has bought Lucasfilm and is prepping the release Episode VII in 2015) is by far the biggest Star Wars news in over a decade and paves the way for a very active Star Wars packed future. I imagine that the notion of a post Return of the Jedi sequel is an exciting one for a lot of original trilogy fans who, like me, were a little disappointment that Lucas instead chose to explore the prequels rather than advance his current story. Couple this with the fact that we’ll have some fresh writers and directors at the helm, working with Lucas as a consultant, and I think this announcement is ripe with opportunity. Disney is doing some amazing things of late with both Pixar and Marvel, and there’s plenty of talented creatives that can be brought on board. Once you’ve spent four billion dollars there is an impetus to get it right. As a long time fan, talk of Episode VII really gets my mind racing. What will it be? How can it work? What are the challenges that the filmmakers need to overcome? I have plenty of thoughts about all of this, so let me break it down with you... after the jump! Firstly, the elephant (bantha?) in the room. A vocal minority on the Internet are going to insist that the sequel trilogy follows - or is at least linked to - Timothy Zahn’s Thrawn trilogy. No. No no no no. Wrong. I appreciate that you enjoyed those books, and I hope you continue to enjoy them, but I don’t think they’re a good fit at all for the epic sci-fi/fantasy action adventure that the new Star Wars needs to be to reinvigorate the franchise and hit its mark. I think we need something new, we need to be surprised, and I do what Lucas to have enough input that we at least get a sense of the direction that he had planned for his saga. Let’s forget about Zahn for now. The tricky thing is that the first six episodes tell a complete story - the story of Anakin Skywalker/Darth Vader who, of course, died in the last episode. So now what? With that rationale it seems to make sense to at least stick to the Skywalker lineage, be it Luke or future generations. Without that Skywalker influence its hard to imagine how these films would be linked enough to form a cohesive whole. We pick up soon after the events of Jedi and continue the story with a new bunch of actors. This is the easiest option for Disney’s long-term plans, but man are those some pretty big shoes to fill, especially Han Solo. Audiences have proved very adaptable though - we have no problem accepting new Batmen or Spider-Mans... we’d all adjust if the films were good. Some of you might even find yourselves saying, “Man... who’d have thought that Zac Efron is a much better Luke than Mark Hamill. Can they set these films thirty years after Return of the Jedi and bring back the old cast? I think Harrison would be fine, but Hamill is going to take some work. I can’t imagine them going this route unless they were very small roles... i.e. put the old cast in leadership positions but focus on new, younger characters who are out there doing all the work. An old cast is not sustainable for all the movies they have planned, so it would probably just be a case of bringing them back for a nod to the originals and then moving on with the new. Disney wasn’t afraid to put a CGI young Jeff Bridges in Tron Legacy, but again it’s not sustainable for a long run of films, plus it’s not cheap to do, nor is it anywhere near 100% believable for the audience. I can only imagine it if it was like the situation listed above where they were in small roles that supported a new cast. They could, of course, just jump 50 years plus into the future and not use the original characters at all, instead focusing solely on the next generation. Some news articles are already saying that the intention is to carry on the stories of Luke, Leia and Han but I’m not sure if this is just speculation. (Update: No? Apparently that statement is confirmed?). I think there are two major practical concerns from a storytelling perspective. We need a new villain who has to rival the combination of Vader and the Emperor. And in the post Return of the Jedi universe we supposedly have no Sith and only one guy who can wield a lightsaber. You CANNOT have a new Star Wars trilogy without lightsaber battles, so solving that problem is the single biggest clue as to the direction they need to take this. Which means lost Jedi or secret Sith? - Palpatine planned his rise over decades. He likes to plan things. To think that he wouldn’t have a contingency plan in the case of his death, or destruction of the second Death Star is kind of out of character. Order 66 showed us that a huge change of events could be triggered at the right time. Who is to say that his death is not a trigger for something else. - I’d like to see the tables turned. In effect the Sith/Empire would become the smaller rebel force planning missions and attacks while the Rebel Alliance would be struggling with becoming the larger ruling body. But you can’t go forward without A LOT of red on blue/green lightsaber action so solving this single problem is going to be key. Man... a lot of cool characters are dead and buried by the end of episode six. No Boba Fett, no Jabba the Hutt. But is there room for the new villains - especially if they are a small fringe group - to start building alliances and recruiting. Why not work with the bounty hunter status quo, or go straight to the hutt homeworld and start building up a network. These are Star WARS so it’s not just going to be a skirmish. We need some galaxy rocking events brewing. And the fracturing of the Empire is as good an excuse as any to start rounding up all the elements we love. Who can we guarantee seeing? At least Artoo and Threepio are bound to be there and will be a linking thread for the new films. Wookiees live a long time so they’d be nuts to go forward without Chewbacca. And how about some love for poor old Admiral Ackbar? If a space lobster can become and admiral then anyone can achieve anything! And what does this mean for our force ghosts? I’d be confident that ghost Yoda or ghost Ben (or both) will be dispensing wisdom, but will Ghost Anakin be teaching from beyond the grave? How does Hayden Christensen feel about all this? Things are going to get weird! This is all the tip of the iceberg and I imagine there will be a lot said in the coming year as we all piece together the form that such a project will actually take. The best part for me is that I’m excited about the possibilities of Star Wars again and I haven’t felt like that for a while. It’s a franchise that’s been present throughout my life and it’s weirdly comforting to know that it’s going to continue in a reimagined form. Looking forward to 2015. Remember our old conversation about the mantle of Vader? THIS IS IT my friend. THIS IS IT. Going to be very interesting times. The more I think about this the more hopeful I am that they're going to get it right! Let's Cast Star Wars Episode VII! Board Game Themed Halloween Displays! Walt Disney Presents: STAR WARS!!! Book review: Dragon Age: The Silent Grove! Bands Playing As Other Bands For Halloween!